The North Central Texas District Veterinary Medical Association is a 501C3 non-profit organization dedicated to the continued education and fellowship of the veterinarians in the North Central Texas area. The NCTDVMA routinely meets monthly at 7:00p.m. on the 4th Thursday of the month at restaurants in Waco, Killeen or the Temple-Belton areas. Once or twice a year, they host a longer (usually a weekend) CE event. It was founded in 1991 by Drs Michael Joyner and Tamra Walthall. Dr. Michael J. Joyner hails from New Castle, Indiana. He completed his Bachelor’s degree in Animal Science at Purdue University and is a 1984 graduate of the University of Missouri College of Veterinary Medicine. He relocated his family for the warm weather and the sunny blue skies of Texas. A leader in veterinary continuing education, he holds a degree from Purdue University Veterinary Management Institute (1994). 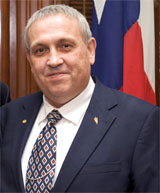 He served as Chairman of the Board of the Texas Veterinary Medical Association (TVMA) in 1998 and as TVMA president in 2003. Currently, Dr. Joyner is the Texas representative to the Southwest Veterinary Symposium, the treasurer of the Texas Veterinary Medical Association and the president of the North Central Veterinary Medical Association. He is responsible for setting up speakers for continuing education seminars in the North Central Veterinary district. Dr. Tamra Walthall has been a solo small animal practitioner in Bellmead, Texas since 1986. In addition to her regular clientele, Dr. Walthall is the veterinary advisor for the Humane Society of Central Texas; an open admission shelter for a six county region. 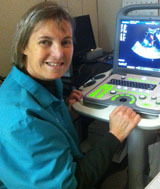 She also enjoys doing ultrasound referral cases. Since 1991, Tamra has been a member of the Texas Academy of Veterinary Practice, and has served several terms as a Director of the TVMA North Central Texas District. Dr Walthall lives in Waco, TX with her husband Roy Walthall, a Professor of Government at McLennan Community College. They have two children; Telly, a public school teacher, and Rydell, a University of Texas student. In her spare time, Tamra enjoys trail jogging with her dogs in Cameron Park.